Total Control Products' subframe connector packages are available for both hardtop and convertible models of 1964-1970 Mustangs and Cougars. Each package consists of weld-in tubular frame connectors and a bolt-in center support to bridge the connectors together. 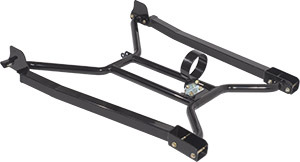 Frame connectors are either 2x2" (hardtop) or 1-5/8"-round (convertible) steel tubing, mandrel bent to tightly follow the contour of the undercarriage. Mounting holes for the bolt-in center support are pre-drilled at the frame connectors, but will need to be drilled through the factory frame rails for installation. Once installed, the center supports create diagonal bracing across the undercarriage, forming a single reinforcement structure that includes the factory subframe and our weld-in subframe connectors. Both hardtop and convertible center supports include mounting tabs for future installation of TCP's rear suspension torque arm, with hardtop versions also providing a mount for TCP's bolt-in driveshaft safety loop. All components are powder coated black or zinc plated.